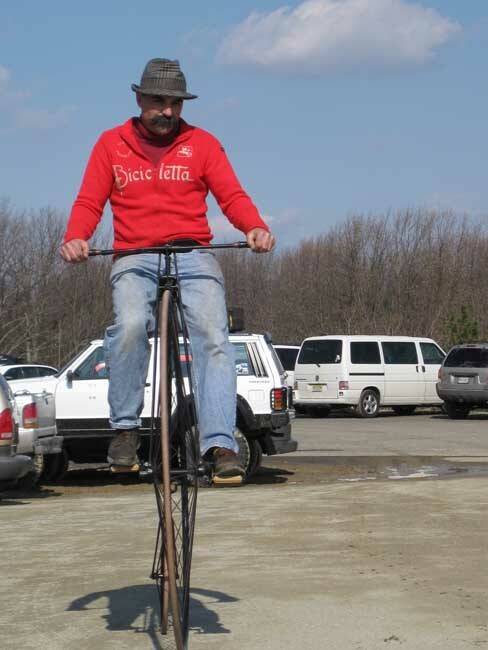 I have been asked many time upon seeing a High Wheeler “how does the rider get up there” and most times the inquiring mind has never seen one in person, let alone someone actually riding one. Without seeing one, you miss the subtle detail of the mounting peg on the lower part of the backbone(frame) of the bike. That mounting peg serves as a the first step in getting atop the bicycle. 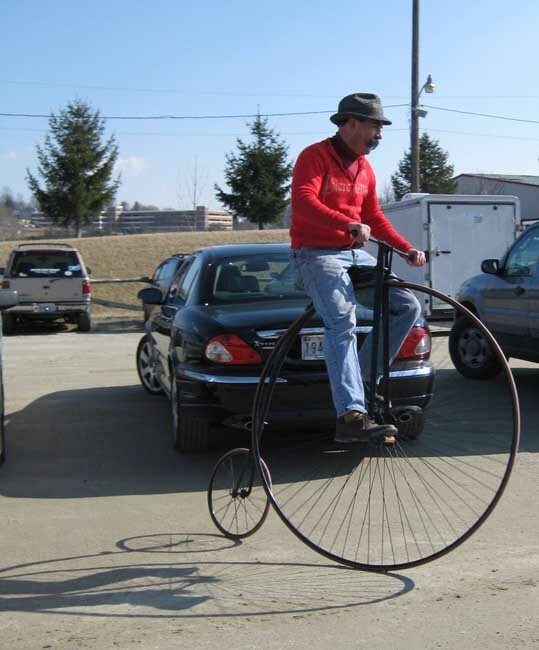 The bicycle used in the demonstration is a Columbia Standard from 1884. It is had recently been tuned and includes high quality reproduction Columbia pedals and a recovered leather saddle. At first, the rider places one foot on the mounting peg. 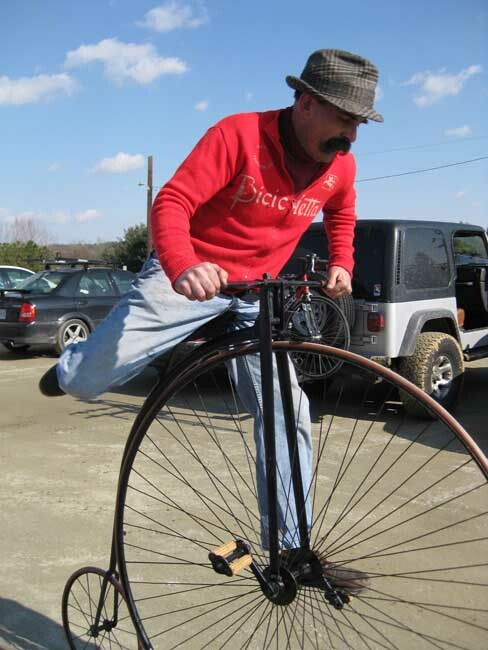 Then holding the handlebars, he pushes off with his other foot to get the bicycle moving. Once in motion, he then pulls himself up onto the saddle, and puts his foot he pushed off from on the ground onto the pedal. 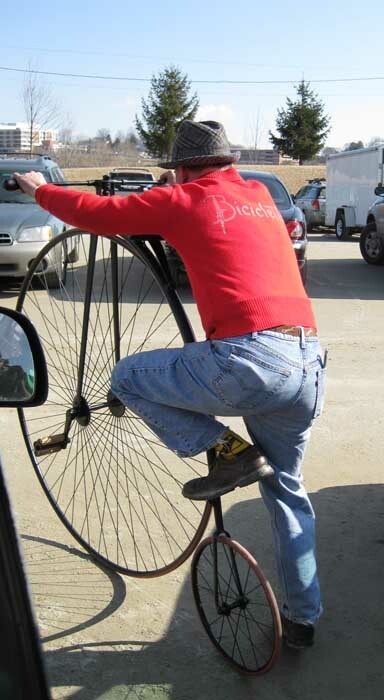 The other foot follows onto the other pedal, and then he is riding a high wheeler. 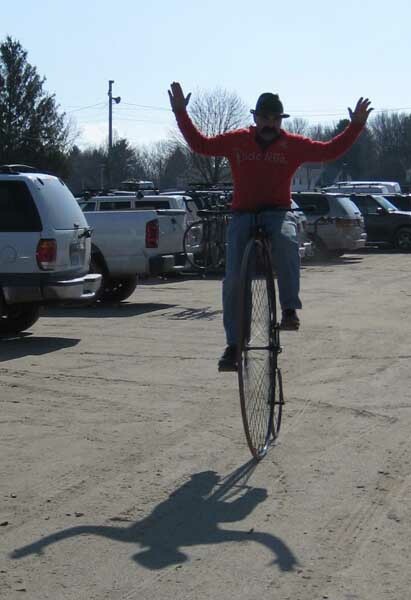 Once up there, it is not much different than riding any other fixed gear bicycle, except for you are a couple feet higher, and knowing that the trip to the ground will be a lot harder! ha! excellent model. If not for the four legged giveaways in the back, I’d think you were time-a-traveling.